Our Date With MyMovieDeals.com…Much Sweeter Than Expected! My husband and I finally got to use the MyMovieDeals.com voucher we got a few weeks ago when the tickets were for Oz, The Great & Powerful. They’ve been sitting due to life, basically. Life is busy, but last Monday, we got a sitter for the youngest one in the middle of the day and used the tickets for a matinee viewing of Oz at AMC 16 in Burbank. I was a little bummed because the tickets were a value of up to $12.50 each, so going to a matinee with tickets at $6 meant we were going to miss out on the full value of the deal. As we purchased the tickets, the brilliant young lady at the ticket booth (I say brilliant, because you should have seen the sketch she was working on) asked us if we had a Stubs card. “No, we don’t.” I replied, to which she informed us we could use the remaining amount of our ticket value to purchase the cards for the family! Deal. 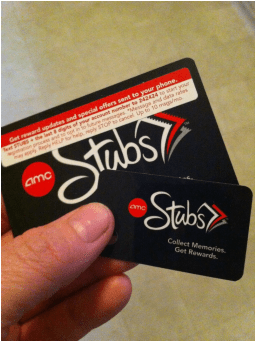 So, not only did we get to see the movie, but we now have the AMC Theatre Stubs for future promotions at the theatre! What I already thought was a great deal, got a little sweeter. We headed to the concession stand, received our free popcorn and sat through the movie, which I have to say, was not my favorite. It was fun, but I’m glad I’m not reviewing Oz here. That was my choice for the MyMovieDeals.com promotion. 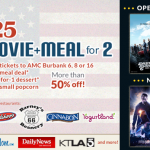 But, as of this week, they have the deal for ANY movie at AMC Burbank 6, 8 or 16! After the movie, we headed over to Chevy’s Fresh Mex for our late lunch. 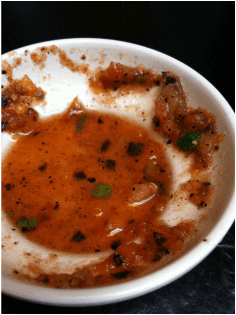 We actually love Chevy’s, and if I didn’t think it would embarrass my husband, I would have spoon fed myself the salsa they serve with chips. De-lish. We enjoyed what we had there, and because of our voucher, only paid $10 + tax and tip for our meal! We are a family on a budget, so going to see movies in the theatre really isn’t on our “Date Night” list of things to do, it gets way too expensive. But with the $25 deal, it was only around $35 for a $56 date. (Tickets, Stubs program, popcorn and two meals at Chevy’s). That’s a savings of $21 for us that day…which of course we put toward the cost of the sitter. More important than the money we saved, however, is the fact that my husband and I got to spend some time together without the huge worry of how much everything cost. 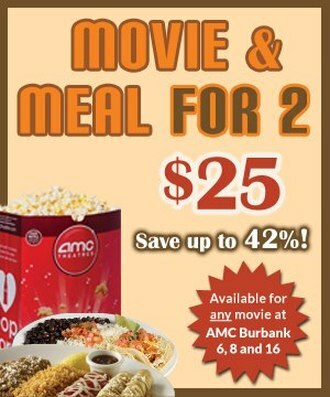 Just to remind you….this deal is for any move at AMC Burbank 6, 8 or 16…free popcorn…and one free entree….it really is a deal. Visit MyMovieDeals.com to plan your next date! MyMovieDeals.com Has Great Deals For Local Moviegoers! HURRY!! Enter TODAY Only To Win a FREE Deal from MyMovieDeals.com. Vouchers Expire Sunday…Have A Date Night This Memorial Day Weekend!! 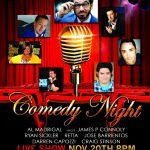 Support The YMCA Youth Scholarship Program With Some Comedy At Flappers!